This decadent almond-peach French toast is like a cross between a bread pudding and a cobbler and is perfect for brunch or special celebration. If you love serving dishes that are unique and rave worthy, bookmark this almond-peach French toast recipe. It is the perfect dish to serve at a shower, tea, or ladie’s brunch/luncheon. I served this almond-peach French toast at a baby shower brunch, and everyone raved! It truly is unique dish that will be a first for most guests.It is always fun taking a dish to an event that no one has ever tried. It makes for great conversation! 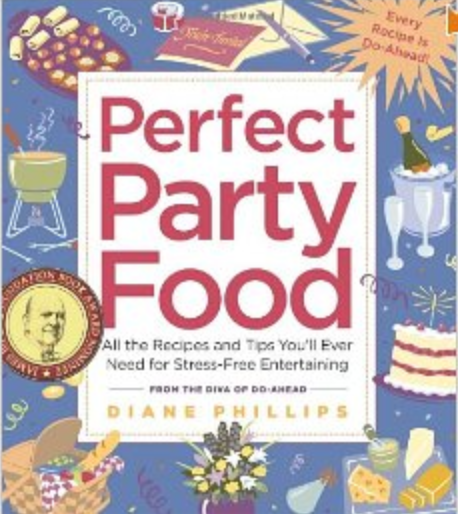 This French toast recipe is just one of my many fave recipes from Diane Phillips’ Perfect Party Food. Diane, known as the Do-Ahead Diva, won the James Beard award for this book that has do-ahead tips for every single recipe. If you are sold on do-ahead cooking like I am, this book is a must-have. Check it out here and take a peek inside. You can get a used copy for next to nothing, and you’ll love this cookbook if you are a make ahead gal. Almond flavoring: The original recipe, which is actually called “amaretto-Peach French toast, calls for amaretto liqueur. If you have this on hand, great; otherwise, just use almond extract. So sorry I don’t have a photo of this, but I promise that it is superb and will be worth every ounce of effort it takes to make it. If you make this, please send feedbacks (and pictures of the dish)! As always, thanks so much for stopping by. Be blessed, and stay savvy!!! Coat a 13 x 9 baking dish with baking spray. To begin the French toast, whisk together eggs, milk, amaretto, baking powder, sugar, and cinnamon. Put bread on rimmed baking sheet (jellyroll pan) in a single layer. Slowly pour this egg mixture over bread, turning slices until totally soaked. To prepare fruit, put peaches, sugar, cinnamon, nutmeg, and cornstarch in the baking dish; stir to coat the peaches; cover with the soaked bread, wedging it in to fit. * DIVA DO-AHEAD: Cover and refrigerate for at least 2 hours or overnight. To make the topping, mix together sugar and cinnamon in small bowl. Sprinkle evenly over bread, and top with slivered almonds. Brush with some or all of melted butter. Bake until golden and peaches are bubbling around the sides of the dish (20-30 minutes). Remove from the oven and sift confectioners' sugar over the top. To serve, lift out squares with a spatula, and spoon fruit sauce over top, if desired.